A senior HMDA official said that the Authority had pooled 189 acres in Pratap Singaram. 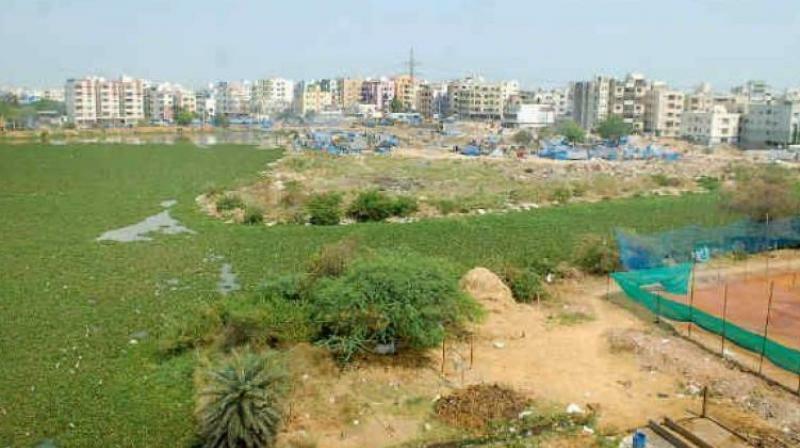 Hyderabad: The Hyderabad Metropolitan Development Authority has decided to put the land pooling scheme (LPS) on hold temporarily. The HMDA, in more than a year, had pooled 180 acres of land at Pratap Singaram out of 440 acres proposed. The HMDA relied on the Pratap Singaram LPS, since based on the outcome, it would pool 1,000 acres of land in Korremula, Gowrelli and Nacharam. The HMDA was expected to garner Rs 800 crore through land pooling. Under the LPS scheme, the HMDA would develop plots in 2,800 square yards in one acre of land and the remaining area would be used to provide basic civic amenities like, roads, water, electricity and sewerage. Once the proposed regional ring road was completed, the land value would increase multi-fold. The HMDA official said it is expected that the new land pooling scheme had given the scope to earn Rs 800 crore by pooling lands in Dundigal, Boduppal, Pratapa Singaram, Bogaram and Gourelli.